I went to Paris. Gosh, it's amazing that I can say that. Ever since I was a teenager, I've wanted to say that. Visiting Paris was my greatest fantasy. In high school, I took French despite my father's constant urging to take Spanish. I took to the language very easily and A'ced my classes. I even took French in college and for a brief moment considered majoring in it. 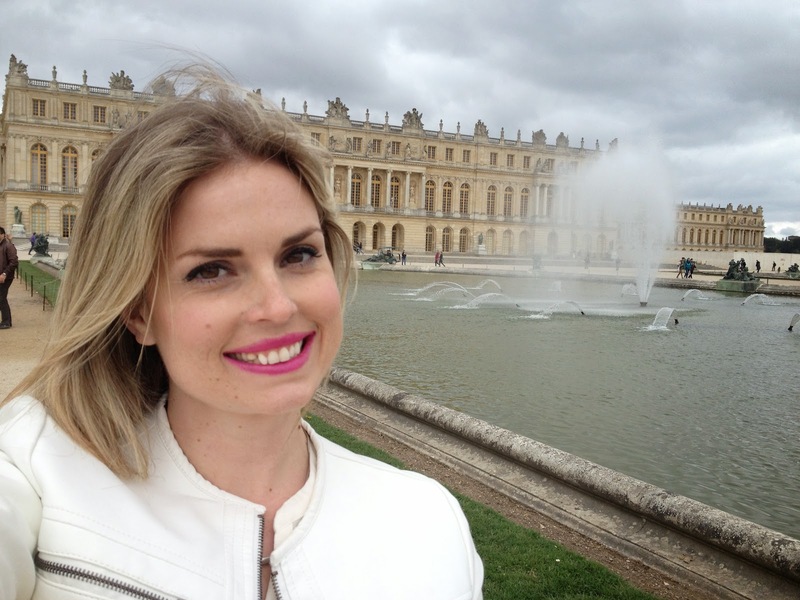 As I grew into adulthood, the dream of going to Paris never died, and then one year ago, a follow teacher and I began talking about the educational tour programs available to teachers and students, and on a whim decided we should put one together. Paris it was, and the next day she had found the perfect tour on EF Tours' website. At the beginning of this school year, we let our classes know about the opportunity and held an informational meeting. We we disappointed by the turn out, but slowly students began to sign up. The only catch was, in order for both Andrea and I to go, we needed twelve students/parents to sign up. As time passed we got nine--nine wasn't enough. I wasn't going to go. Then, miraculously, just two months before the trip and weeks after the sign up deadline had passed, three students enrolled. I was going...I was going! I have to say, it definitely took time to set in. I had already resolved myself to the fact that I wasn't going, but I now had six weeks to scramble and get my passport. All things went smoothly in that department, and then the count down began. Nathan was so understanding, and despite his hectic schedule he supported my going. We went over Spring Break. Our trip included a few days in Paris, a few days visiting different towns in Normandy and Brittany, and then a return to Paris. Because I was enrolled in the trip so last minute, I was booked on a different flight than everyone else. Well, I flew from LAX to JFK with the group, but in New York I transferred flights and was on my own. That was the most stressful parts of the entire trip. Never again do I want to to fly out of JFK for an international flight. The terminal was a zoo, the security lines were atrocious, my layover was that long, and people were mean. As I waited in the winding security line, I called Nathan. I needed to hear his voice, but I didn't let on to the fact that I was on the verge of tears. I didn't want to worry him. Somehow I made it. Unfortunately, I was so anxious I couldn't sleep a wink, and the man next to me was snoring. I knew I needed to sleep, but I just couldn't. After nearly seven hours, I landed in Paris. I went to claim my luggage, but after waiting for quite a while, it became clear my bag was no where to be found. My heart was racing. Where was my bag? Trying to remain as calm as possible, I found the baggage services office. The nice lady was able to track down my bag and informed me that it missed the transfer at JFK and was placed on the next flight. Wonderful. She told me it would be delivered to my hotel by the end of the night. By the time all this was taken care of, the rest of the group arrived. I was relieved, it had been a very long, stressful nine hours. We met out tour guide, went to our hotel, had about a half an hour to freshen up, and then we hit the group running. 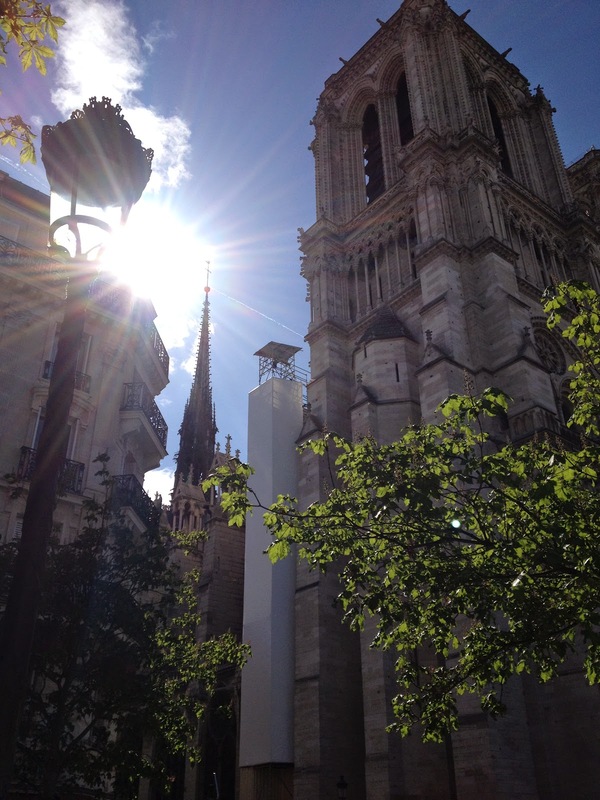 Our first stop was Notre Dame cathedral, but before we got there we walked through the beautiful streets of Paris. Notre Dame is beautiful. Inside there are amazing stained glass windows and amazing arches, but for some reason I really wanted to see the flying buttresses. I had remembered learning about them in my humanities class, and needed to see these revolutionary architectural structures. 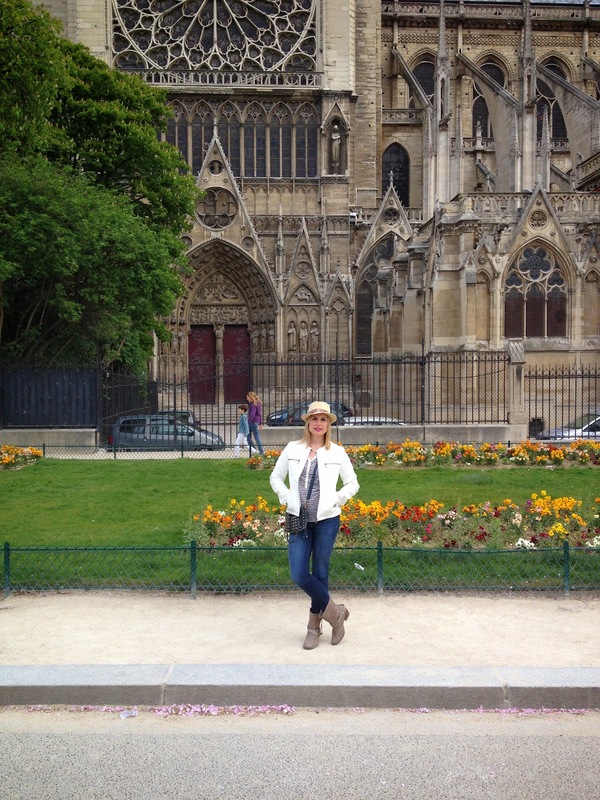 Notre Dame is along the Seine River and the Paris marathon was that day. These purple trees are all over Paris. It was so beautiful the way their peddles blew over the ground. They looked like purple snow flakes. I've resolved to plant them in my backyard. I've since found out they are called Empress Trees. On our free time, Andrea and I found this charming quintessential cafe. The bridges are beautiful in this city. After Notre Dame, we were scheduled to go to the Palace of Versailles, and on the way there, I got my first glimpse of the Eiffel Tower. My heart skipped a beat. All the anticipation, and all the dreaming led to this. It was as beautiful as I imagined. 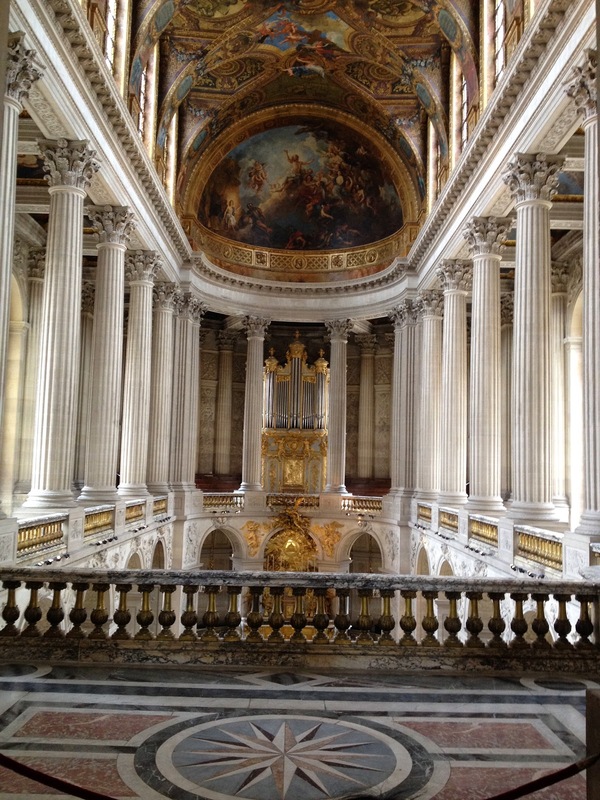 The Palace of Versailles is so amazing and so opulent. We had a local expert take us on a guided tour discussing its history and all its little intricate stories. The cool thing about this trip was the whole "educational" aspect of it. I learned so much about France and it was all so interesting. The Hall of Mirror: In addition to the gardens, this was one of the places I looked forward to seeing most. 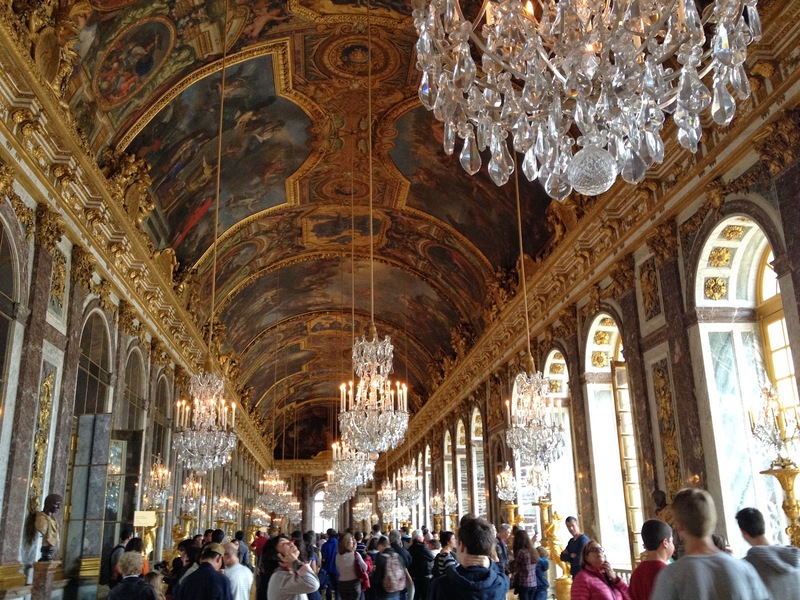 All the gold, all the mirrors, and all the chandeliers make this place is one of the most lavish and extravagant places I have ever seen, scratch that, it is THE most lavish and extravagant place I have ever seen. I loved being in a place that so many important historical events took place. Everything in this palace is French (and if it wasn't, it was passed off as French). The French have great pride in their culture and you really see how its been that way since Louis IV, The Sun King (hence all the gold). The gardens go on for days! We were able to unofficially see The Arch de Triumph on the first day as well as our dinner location was right there. -Andrea and I ate a really good crepe avec jambon et fromage (crepe with ham and cheese) and hey were really yummy. -I jumped right in to using my French and I loved it. 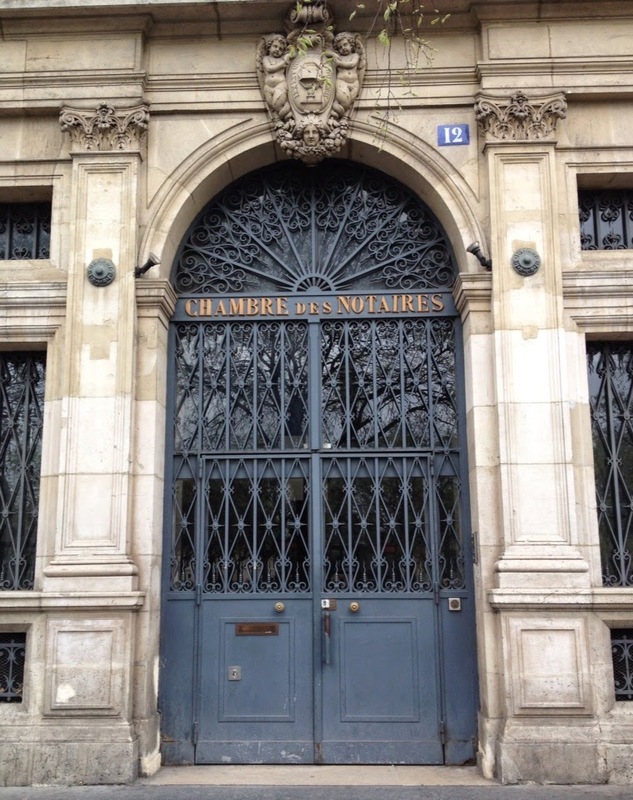 -There are amazing doors in Paris. I wish I took pictures of more. -Seeing things I'd only heard of, or dreamed of was surreal. -Paris is as beautiful and you'd imagine. -All the people I encountered were nice. -My baggage made it to my hotel.